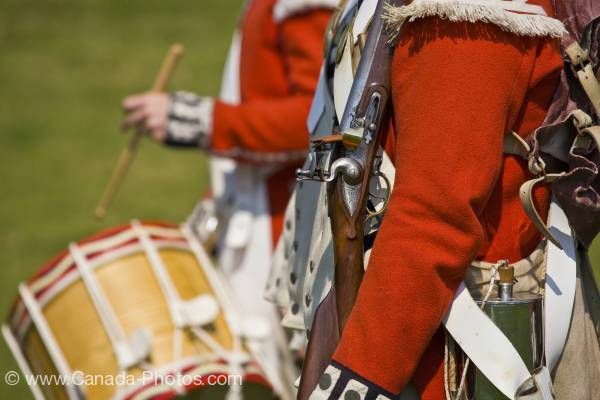 This stock photo shows the red and white uniforms of the Signal Hill Tattoo, a march and display at Signal Hill National Historic Site in St John's, St John's Harbour, St John's Bay, Avalon Peninsula, Newfoundland, Newfoundland Labrador, Canada. The Signal Hill Tattoo military display black and white trim on bright red jackets as they march at the Signal Hill National Historic Site. Silver buttons are sewn on the white part of the trim on the front of the jacket and cuff of the sleeve. At the top of the arm is a single row of white fringe. Signal Hill Tattoo, Military march and display at Signal Hill National Historic Site in St John's, St John's Harbour, St John's Bay, Avalon Peninsula, Newfoundland, Newfoundland Labrador, Canada.